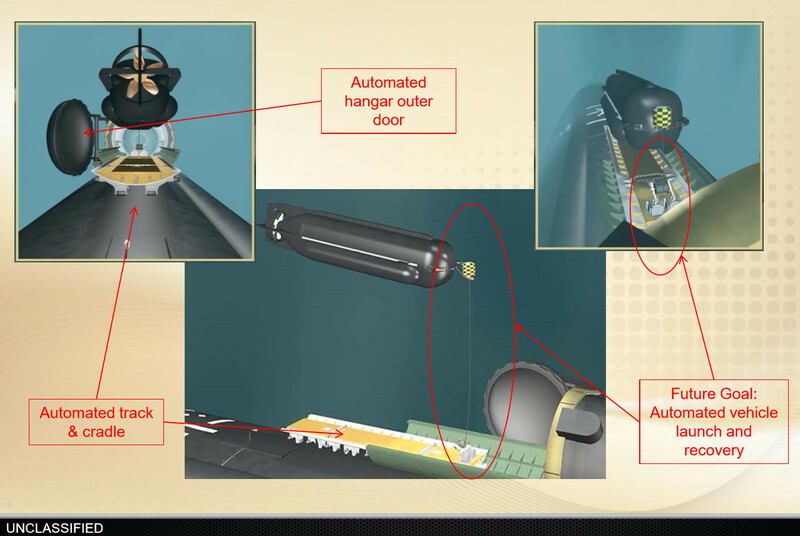 The Future Submarine is a highly-automated stealthy boat densly packed with weapons, Special Forces submersibles and unmanned vehicles. The design explores the potential of emerging technologies to allow innovative arrangements which enhance overall operational capabilities. Next-generation US Navy and Royal Navy nuclear-powered attack submarines (SSN(X) and SSN(R) respectively) will refocus on deep-water anti-submarine operations. While being hugely capable boats, this will take them away from the littorals where many of today’s submarine operations take place. 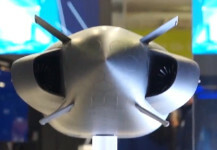 They will be used less in inshore ISR (Intelligence Surveillance and Reconnaissance), Special Forces support and Land-Attack. 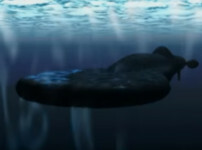 This concept could fill that void and provide a bridge to coming age of extra-large combat Unmanned Underwater Vehicles. In this role the Future Submarine will operate as a host platform for an array of unmanned vehicles of various sizes. The boats could also fulfill time-consuming officer training and trials duties which also detract from SSNs’ operational capacity. At the same time the Future Submarine must have smaller crews, partly due to recruitment and retention challenges. 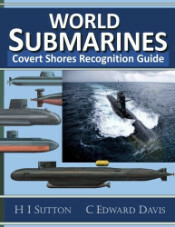 The Concept of Operations (CONOPS) is a small littoral submarine deployed from minimally equipped forward operating bases in-theater in the Mediterranean, Baltic, Norwegian Sea/North Sea and Western Pacific/South East Asia. As well as mitigating the inherent speed/distance disadvantage of conventional boats, the small crew and forward deployment model will have a positive impact on submariner recruitment and retention thanks to the better shore-sea balance (including all-important social media access) and exotic R&R opportunities. One of the most visible concepts in this design is the twin outboard pumpjet propulsors. 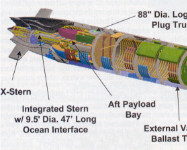 Since the 1960s almost all new submarine designs have featured a single propulsor positioned on the center-line. This required the sacrificing of stern-aspect torpedo rooms. Pumpjet propulsors have been discussed by Naval architects on both sides of the Atlantic since at least the early 1960s but they were only later secretly introduced on British attack submarines in the 1970s. They have slowly become more common with nuclear powered submarines. Their main advantage in submarines is acoustic signature reduction at higher speeds, making them generally less applicable to diesel-electric submarines. Today they are used on all British, most American, most French and some Russian SSNs and SSBNs. The current generation is axle-drive, being fitted along the centerline in the same manner as a regular screw. 1 & 2. 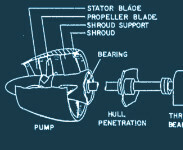 USN Navy drawing of pumpjet design, 1963. 3. 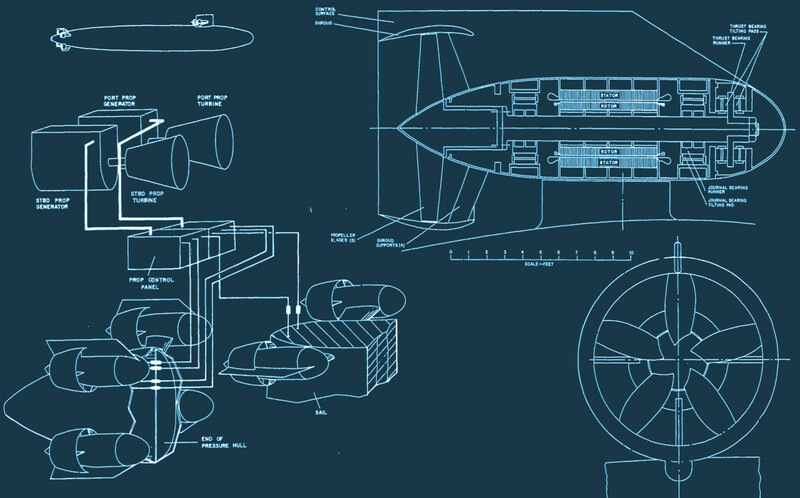 US Navy pod-mounted pumpjet design, 1963. 4. 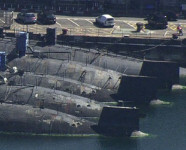 Royal Navy Swiftsure Class SSNs after retirement with pump jets just visible behind rudders. Photos of RN pumpjets on Churchill, Swiftsure and trafalgar Classes are extremely rare. The emerging technology of Rim-drive pumpjets frees the design from having to have a center-line propulsor. Instead two pump jets can be mounted either side, which means that the aft compartment of the submarine can be reclaimed for a torpedo room, or in this case for a larger hangar for underwater vehicles. A) Sideways-opening hangar door. B) annular compressed air flask. C) Tube tank and compensation tank for hangar. D) Aft ballast tanks. E) Swimmer Delivery Vehicle (SDV) or similar vehicle. F) Access trunk. G) hyperbaric chamber for diver decompression (/saturation living). Laying position to allow sleep and/or casualty handling. 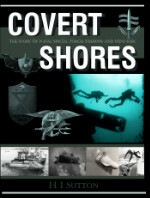 H) Special Forces / UUV crew accommodation and working space. British BAE Systems future submarine concept with twin faired-in pumpjets. 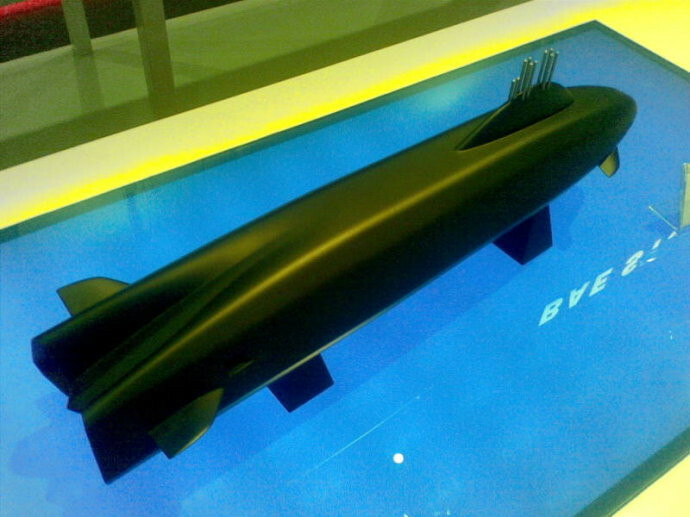 British BAE Systems Maritime Underwater Future Capability (MUFC) concept from 2012. The outboard twin pumpjets can be moved up and down to act as thrusters in place of hydroplanes. 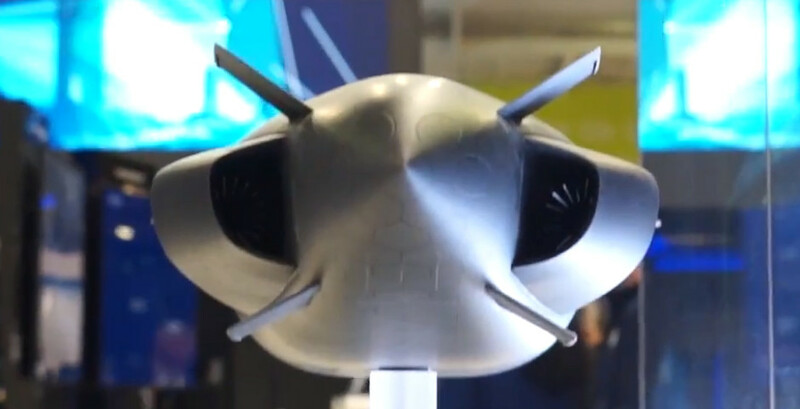 French Naval Group SMX-31 concept from 2018. 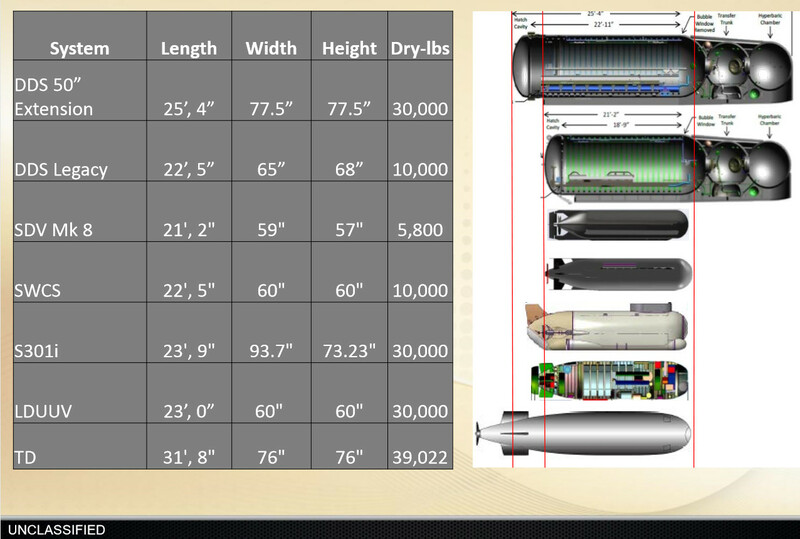 Between the rim-drive pump jets are four heavyweight torpedo tubes and a larger UUV hangar. A) Outer streamlined doors. B) SDV or LDUUV. C) Recovery buoy with hook. D) Automated hatch and outer doors. E) Vehicle securing trap on cradle runners. F) Diver lurk. G) Doors to diver lurk. H) Three-person lock in / out trunk. I) Mission space including main Special Forces accommodation. J) Cradle. K) Winch on cradle runners. 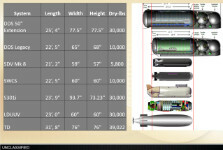 L) Larger diameter hatches for ease of mid-size UUV, Special Forces gear and casualty movement. 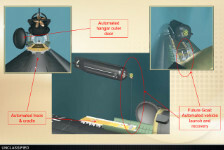 Four forward-facing torpedo tubes are located in the bow inside a larger cylindrical tube tank. These are fed by a fully automated torpedo room with up to sixteen full-size reloads. Armament carried here would consist of mainly heavyweight dual-role torpedoes and lightweight torpedoes, as well as small unmanned underwater vehicles. Land attack cruise missiles and anti-ship missiles could also be accommodated but would ordinarily be in the vertical launch system if fitted. 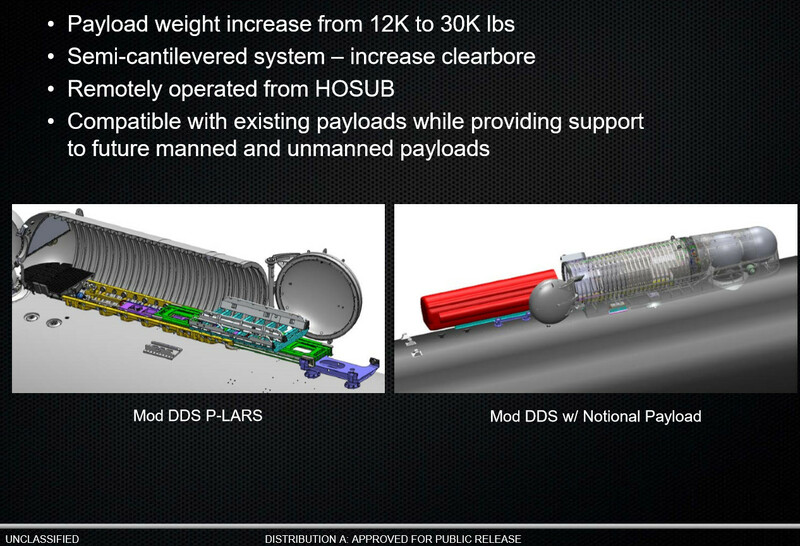 The aft SDV/large UUV hangar could accept a seven-tube insert for torpedoes and missiles. This gives a theoretical load of forty three 533mm weapons in total. A) Four main torpedo tubes. B) Vertical launch tubes arranged in groups of four per hull frame, so typically twelve tubes (3 frames). There is space to walk down the centeral corridor. 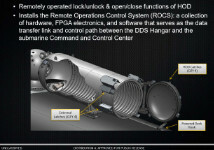 The module is self-contained with compensation tanks located in the lower part of the compartment. C) Torpedo tube insert for SDV / large UUV hangar. 2. Minimum height sail with non-penetrating telescopic electro-optical periscope and EW masts folding into upper part of sail. Shorter non-penetrating telescopic masts (radar, surface comms etc) in sail.